Ava and Sonny in the General Hospital spoilers. The General Hospital spoilers for Friday, May 5th, foretell that Ava continues to be a living example of having nine lives. Dear ol’ Ava (Maura West) has a lot of cat-like characteristics, doesn’t she? Look at her in the above photo, looking like a kitten taunting a play pal and then pulling back as the pal reacts. Of course, Sonny (Maurice Benard) is no pal of hers. When Ava figures out what’s up with Sonny and his latest vertical tango partner, Martina (Daya Vaidya), she angers the mobster. He tells her to stay out of his divorce, or she’ll regret it. Related: Maurice Benard out and about with another daytime power player. While Brad (Parry Shen) plants seeds of doubt in the most fertile anti-Finn soil, Lieszl Obrecht’s (Kathleen Gati) mind, Hayden (Rebecca Budig), who believes Finn, as she should, that he hasn’t used drugs, makes a bold query of Griffin (Matt Cohen). She asks him how would it change Finn’s precarious fate if there were a test that could prove he were set up. Also: Laura Wright thrilled fans at this event. 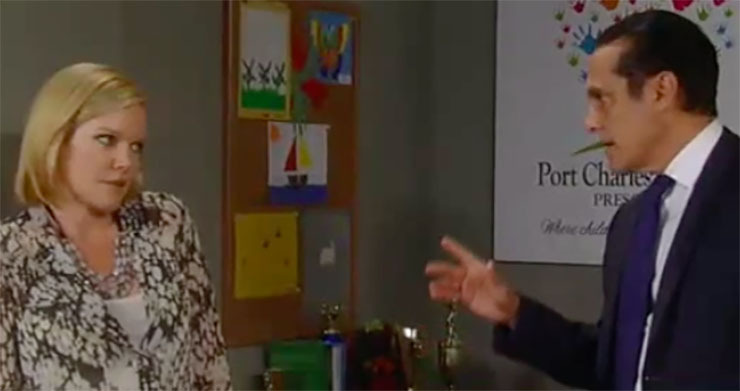 At PCPD’s Interrogation room, which Soap Cities has said should be named after Julian (Will deVry), he spends so much time there, Alexis (Nancy Lee Grahn) stands at the door. Julian tells her he doubts the truth will set either of them free, as the old saying goes. Don’t Miss: Nancy Lee Grahn dished on a bunch of Alexis and GH-related topics. Next Article The Young and the Restless Spoilers, Friday, May 5th: Chelsea Has a Past With Whom?